Does the story sound familiar? Like millions of other little girls in the world, I was born into a family who knew nothing about horses. They didn’t understand this force inside my gut that pulled me headfirst toward horses. They passed it off as a phase for 16 years, despite constant pestering that I simply needed to learn to ride. As soon as I could, I got involved with volunteer organizations. I got a job. I worked long hours at a fast food joint, and went to high school. I sacrificed countless hours of sleep, thousands of hard-earned dollars, and a social life to learn to ride. I even had to make the decision to turn down a free horse offered to me because I knew that the financial burden would be too much if he would get injured or fall ill. I wouldn’t trade a second of it. It would be impossible to repay all the people who have become mentors to me, all the horses who have lent me their strength and grace. 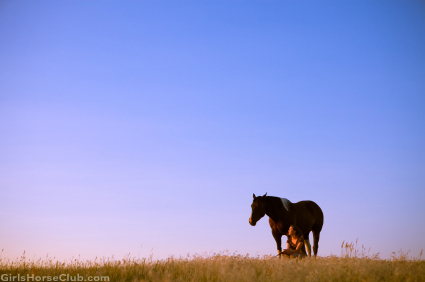 Horses have helped me find the courage to fight an eating disorder and self harm. They’ve pushed me to go on adventures I was scared to take. They have molded me into a person I can be proud of. Years ago I was a regular follower of Girls Horse Club. Back then, I didn’t ride. I had no idea of the beautiful things my life would hold, and I certainly never expected the hard, scary parts. Looking back, I can’t imagine where I would be if I hadn’t had a horse by my side. Returning to Girls Horse Club now, as a legal adult of 18 years, I want to tell you all to keep riding. Keep loving, keep hoping, keep following your heart, and keep fighting. I now have a job where I am in a position to help others using horses. My heart and soul are happy here, and I believe I am exactly where I am supposed to be. I hope the horses in your lives will take you to the same place. That is sooo true!! You did a beautiful job and that is very inspiring to everyone young like the rest of us! wow that was seriously amazing and inspiring well done! This is sooooooo good! This is very inspiring to all the younger bloggers like me!